The drive from the airport was interesting. The driver was crazy and swerving all over the road and in between cars (a common theme in South America) and all I could see on either side of the highway were houses in complete poverty. It was the slums of Rio. The houses looked like they were going to fall down at any minute. 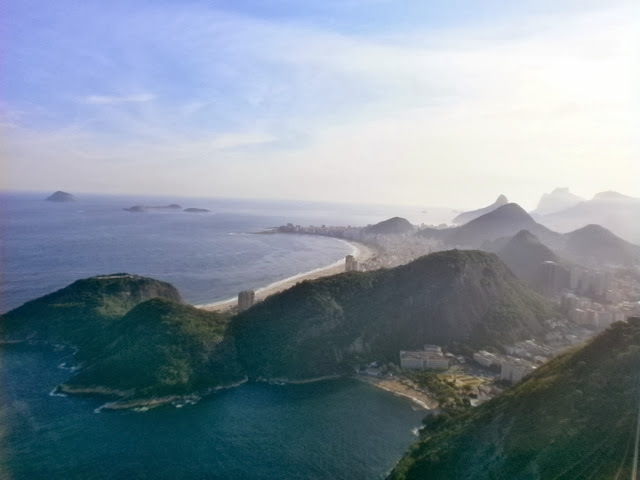 It was far from the glamorous vision of Rio I had in my head. Everything about this beach is amazing! Everyone hires umbrellas and chairs to sit on which makes so much more sense than sitting uncomfortably on towels with no shade for when you get too hot. Why don’t we do this in Australia? There are people continuously walking up and down the beach selling things to suit your every needs. Thirsty? Well there’s beers, water, coke, coconuts and lemonade. Hungry? There’s Chips, Empadas, shrimp, acai, cheese and ice creams. Need some clothes or jewelry? No problem! How about a new bikini? No worries, they sell them too! You don’t even have to get out of your beach chair, it all comes right to you. It was all so exciting at first, seeing what would come past next but it gets a little annoying after a while, all these people yelling things and trying to sell you stuff ruining your peace and quiet. The people aren’t pushy though, a simple ‘no thanks’ and they are on their way. Perfect! It was such a novelty to me to be able to buy bikinis right on the beach! Our first day there we brought our tickets to go see Christ the Redeemer the next day. I was so excited! 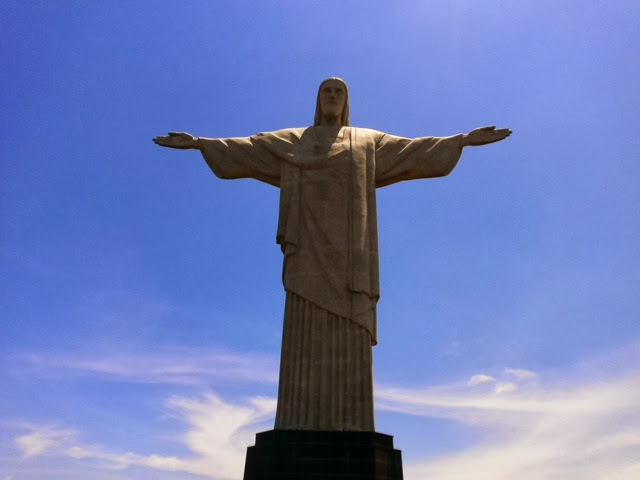 Christ the redeemer was another big thing for me that I had been dying to see for so long. It’s such a famously known monument worldwide and is also a new 7th wonder of the world. When we woke up it was so cloudy. We were disappointed because we though the statute wouldn’t photograph well seeing as it was white and would be against the grey background, but never mind we were still excited to be going! 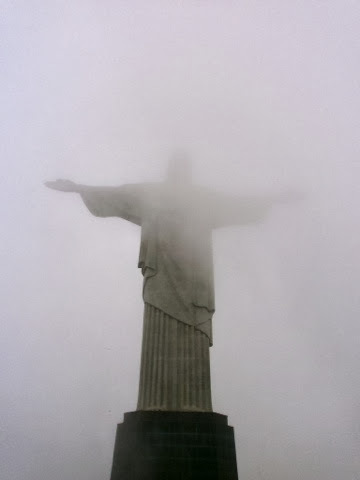 When we arrived we were told that there was no visibility and the scenic train ride up Corcovado mountain that everyone loves, was having maintainece so we could only go up half way then we would be put into mini vans. Talk about bad luck!! When they said no visability I didn’t quite prepare myself for what that actually meant. When we got up the top I could see literally NOTHING. 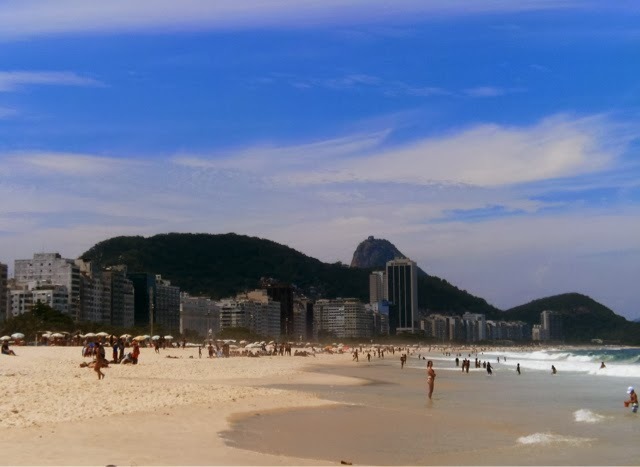 No pretty views of Sugar loaf mountain and Copacabana beach like I had dreamed of, everything was Completely white! We climbed the stairs still hoping we could see the statue. When we reached the top my heart sank, I couldn’t even see his head. We hung around for a bit to see if the fog would clear but it didn’t look like it was going anywhere anytime soon. We left feeling so disappointed which was not at all how I had imagined feeling after seeing the famous statue. We decided that the next sunny day we had we would jump straight on a bus and go see the statue for the second time. Luckily for us that happend the very next day! The sky was blue for as far as the eye could see and it was a toasty 38 degrees. This time we skipped the train and got a mini van all the way up. It was cheaper and quicker with less lines to wait in. It was a very windy ride up the mountain, thank god it took my motion sickness pills before hand. Once we got the the top I could feel that the whole place had such a different vibe to it, there were so many people and everyone was so excited and rushing to take photos. 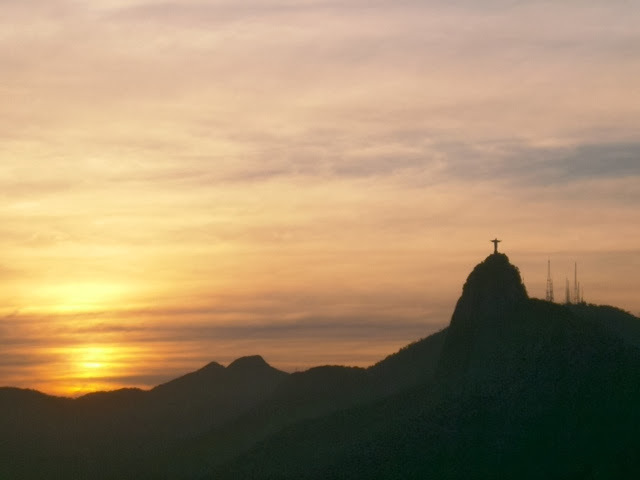 Finally the moment I had been waiting for, Christ the Redeemer looming over the city with open arms. It is such a big statue, so high up a mountain and has a great amount of detailed carved into it, it really is an amazing sight to see. Not to mention the glorious views surrounding him. 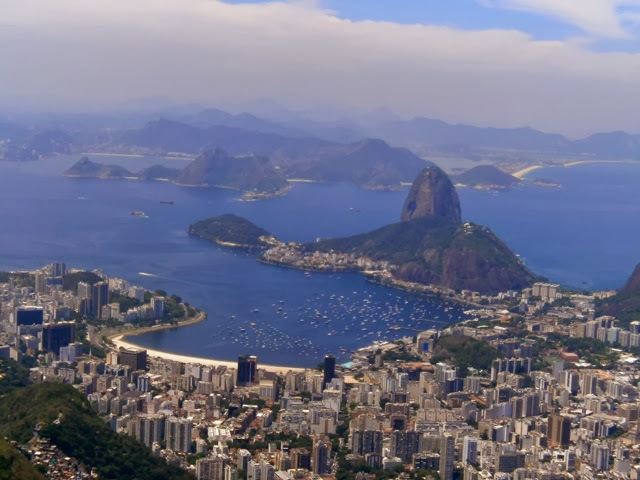 I could see Copacabana and Ipanema beach, that stadium and Sugar loaf mountain. It was breath taking. It was so disgustingly hot, but nothing was going to stop us making use of this amazing weather today. 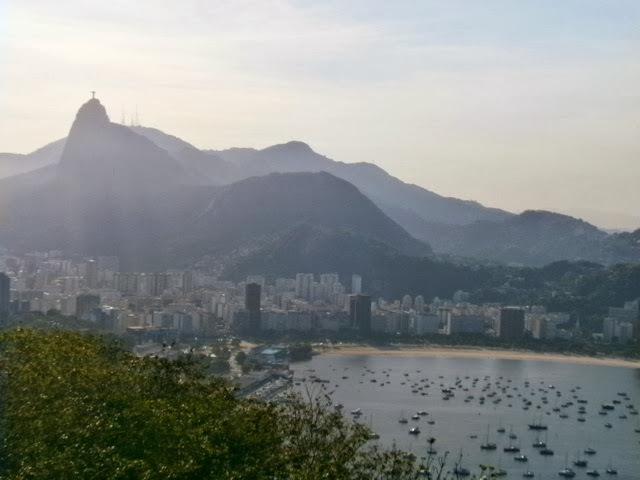 We jumped on a bus to Sugar Loaf mountain on the other side of town. By the time we had lunch and caught the cable car up the mountain, it was late afternoon which meant we would be able to catch the sunset up there. The views were absolutely stunning and the sun shining on the mountains and making them look all misty just made it even more beautiful. 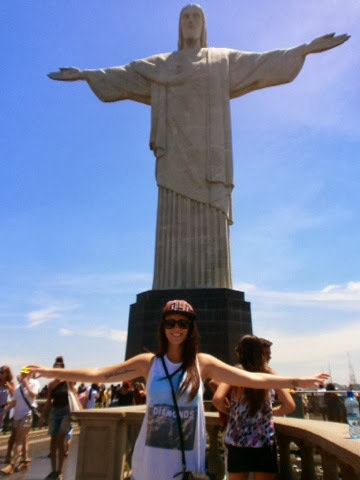 I just couldn’t believe that we had been all the way at Christ the Redeemer just a few hours before. He looked so tiny from here.